Gemini™ High Flow Satellite Mixing Station | Lafferty Equipment Manufacturing, Inc. The Gemini™ High Flow Satellite Mixing Station is a 7 GPM @ 40 PSI chemical proportioner that will simultaneously dilute and blend two chemical concentrates into one accurately diluted solution. 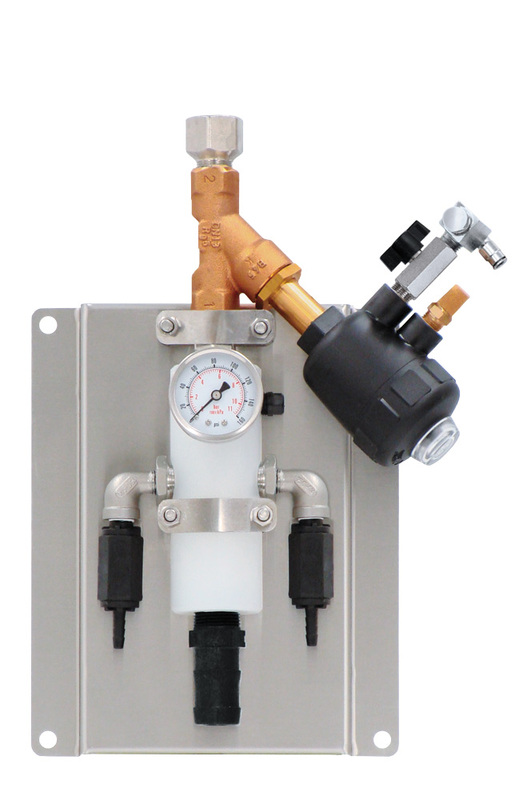 When the air-activated water solenoid is opened by an Air Level Master (sold separately) this venturi injection system uses standard city water pressure (35 - 125 PSI) to draw and blend 2 chemical concentrates into the water stream independently so that the chemicals never mix until they are diluted. The ready-to-use solution is quickly dispensed into a paired Air Level Master Tank (sold separately) or a user-supplied tank. Use multiple Satellite Mixing Stations to refill the tank faster.